What did you think of Ten More or Ten Less than a Number ? To find 10 more than a number, add 1 to the digit at the tens place. To find 10 less than a number, subtract 1 from the digit at the tens place. 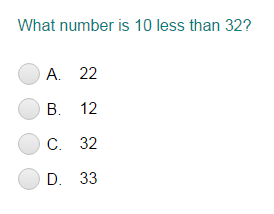 For example: Let's find 10 less than the number 47. Notice that there are four tens in the number 47. To find 10 less than 47, subtract 1 from the digit at its tens place. So, 10 less than the number 47 is 37.